An array of restaurants line Boston’s Newbury Street, yet very few are worth the expense and the trip. Greco is one of Newbury Street’s hidden gems, located near the corner of Fairfield. 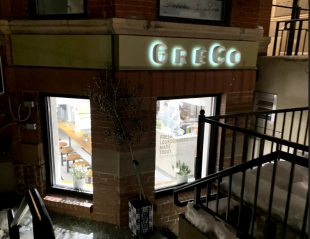 When Greco first opened in early 2017, the new eatery sparked my interest as a local Bostonian. Since that first experience, Greco has become a staple restaurant on my family’s takeout list. Greco promises an authentic yet modern take on Greek food, and they completely fulfil these expectations. Greco provides a modern and welcoming atmosphere. As you enter the restaurant, an overwhelming scent of spices and meat fill the air. Blue patchwork tiles line the floor underneath cozy booths with turquoise pillows. The ceiling has panels of bamboo, creating an interesting array of cultures and colors. Through the middle of the restaurant is a wooden island, with matching stools for seating. On their white, painted brick walls are three Greek words: Kefi (the spirit of Joy), Meraki (the soul or creativity), Philotimo (love of honor). Greco takes these values and magically translates these qualities into their food. The traditional Greco meal is their gyros, which, according to the Greco website, are “made with marinated and roasted meats sourced from local farms, thinly sliced and wrapped in a pita with tomato, onion and hand-cut potatoes.” The pita can be substituted by a salad or a plate, and the fillings with a variety of different types of meats or veggies, and traditional greek sauces. When I first tried Greco’s gyro, I was overwhelmed by the excessive amounts of oil and the heaviness that I felt after eating it. Yet, the food provided a balance between feeling equally exotic and comfortable. I have a staple order: The Classic Pork Gyro without tomatoes; the mildly seasoned pork is enhanced by the zesty flavor that the tzatziki brings. For those who prefer sauces on the lighter side, be advised that the dressing can be added to a somewhat overwhelming degree. Greco’s signature move is putting french fries inside of their gyro. The french fries are thinly cut, and fried perfectly. They’re soft and airy, and they themselves, bring the gyro to another level. Greco has options for the less adventurous eaters, such as salads, soups, and other side dishes. The side dish that I tend to favor is the Greco fries. The Greco fries are the same delicious fries that are inside the gyro, yet served as a side dish, topped with feta and an assortment of seasonings. The salty and tangy taste of the feta perfectly complements the potato-y consistency of the fries. On the window of Greco it reads: “Fresh loukoumades made today. Tomorrow, too.” Though the food is delicious, the loukoumades are truly the highlight of the experience. Loukoumades are small, fried donut holes, covered in an assortment of different toppings. A personal favorite are the Yaya’s. For $6.50 you can experience a small slice of what I imagine heaven to taste like. Yaya’s are loukoumades topped with Merenda (the Greek equivalent of Nutella), crushed Oreo cookies, and powdered sugar. The soft doughy balls melt in your mouth, with the perfect amount of oreo crumbs to add some crunch. The first bite into a Yaya is life-changing.